This chart makes teaching phonics easy from the very beginning. It comes with one set of cards for every letter, which include: a ryhme card, letter card, writing card, 4 photo cards, and a whiteboard space for writing. My kids are really excited about their new 'learning wall' and especially like repeating the rhyme. 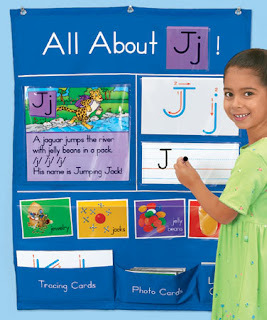 I like that it is a complete set, and ready to go for learning a new letter every week. Click the picture for a link to this item from Lakeshore Learning.